A lot of time passed since my previous post in this series. I was busy with work, participating in FOSDEM, blogging about profilers and sharing various lists of MySQL bugs. But I do not plan to stop writing about my usual weeks of doing support engineer's job. So, time for the next post in this series, based on my random notes taken during the week here and there. This week started for me with checking recent MySQL bug reports (actually I do it every day). I noted recent report by Roel, Bug #85065. Unfortunately it was quickly marked as "Won't fix", and I tend to agree with Laurynas Biveinis that this was probably a wrong decision. See a discussion here. Out of memory conditions happen in production and it would be great for MySQL to process them properly, not just crash randomly. Roel does a favor to all of us by checking debug builds with additional unusual failure conditions introduced, and this work should not be ignored based on some formal approach. It's a common knowledge already that I try to avoid not only all kind of clusters, but all kinds of connection pools as well, by all means. Sometimes I still fail, and when I find myself in unlucky situation of dealing with connection pool in Apache Tomcat, I consider this reference useful. This week I had a useful discussion on the need for xtrabackup (version 2.4.6 was released this week) on Windows (customers ask about it once in a while and some even try to use older binaries of version 1.6.x or so from Percona) and any alternatives. I was pointed out to this blog post by Anders Karlsson. I remember reading something about using Volume Snapshot Service on Windows to backup MySQL back in Oracle in 2012, and really have to just try how it works based on the blog above and this reference. But I still think that, at least without a command line wrapper like mylvmbackup, this approach is hardly easy to follow for average Windows user (like me) and is not on pair with xtrabackup for ease of use etc. I do not have it automated, so sometimes the exact command line gets lost in the history of bash... Never happens with MySQL from Facebook or MariaDB (as we see new commits almost every day), but easily happens with MySQL 5.7 (because they push commit only after the official releases) or Percona Server (as I do not care that much about it for a year already...). This time I noted that one actually needs numactl-devel package to build Percona Server 5.7. Was not the case last time I tried. I also paid attention to blog posts on two hot topics this week. The first one is comparing ProxySQL (here and there) to recently released MaxScale 2.1. I probably have to build and test both myself, but ProxySQL seems to rock, still, and I have no reasons NOT to trust my former colleague René Cannaò, who had provided a lot of details about his tests. Another topic that is hot in February, 2017 is group replication vs Galera. Przemek's recent post on this topic caused quite a hot discussion here. I still consider the post as a good, useful and sincere attempt to compare these technologies and highlight problems typical experienced Galera user may expect, suspect or note in the group replication in MySQL 5.7.17. Make sure you read comments to the blog post, as they help to clarify the implementation details, differences and strong features of group replication. IMHO, this post, along with great series by LeFred and comments from community, really helps to set proper expectations and setup proper understanding of both technologies. This week I worked on several interesting customer issues (involving Galera, CONNECT engine, security concerns, MySQL 5.1 and the limit of 64 secondary indexes per InnoDB table etc) that are not yet completely resolved, so I expect a lot of fun and useful links noted next week. Stay tuned! It seems recent post on Group Replication by Vadim caused an interesting discussion on Facebook. I am NOT going to continue it here, but decided to present some facts, specifically, list of public bug reports and feature requests for Group Replication (mostly "Verified", that is, accepted by Oracle engineers as valid) as of MySQL 5.7.17 (where the feature is promoted as GA), with just few comments to some of the bugs. The goal is to double check this post when next Oracle MySQL 5.7.x release appears, to find out how much Oracle carews to fix the problems already identified by MySQL Community. Bug #84315 - "add mysql group replication bootstrap option to init script". Fair enough, we have a way to boottrap a cluster for a node in all implementations of Galera cluster. This feature request is still "Open". Bug #84329 - "Some Class B private address is not permitted automatically". Manual seems to say it should be. Bug #84337 - "Configure mgr with out root user encounter an error". Seems to be a duplicate of Bug #82687, that is, known for quite a some time before GA.
Bug #84367 - "START GROUP_REPLICATION should be possible without error". You get error if it was already started. Not a big deal, but some optional clause like IF NOT STARTED may help (in a similar way to DROP TABLE ... IF EXISTS) to code scripts. Still "Open". Bug #84710 - "group replication does not respect localhost IP". may be a problem for some MySQL Sandbox setups in a hope to test group replication. Bug #84727 - "GR: Partitioned Node Should Get Updated Status and not accept writes". Writes on partitioned node are accepted and hang (forever?). As a side note, I think Kenny Gryp deserves a special recognition as an early adopter of Group Replication feature who cared to report many problems noted in the process. Bug #84728 - "Not Possible To Avoid MySQL From Starting When GR Cannot Start". We need this fixed to avoid split brain situations by default. Bug #84729 - "Group Replication: Block Reads On Partitioned Nodes". In Galera reads are blocked by default when node is not considered a member of cluster. Bug #84730 - "Feature: Troubleshoot Group Replication Transaction Rollbacks". You can get a lot of information about conflicts in case of Galera. Sorry that I have to compare, but when discussing the ways of dealing with common problems in cluster environments related to MySQL one can not ignore existing solutions (NDB clusters and Galera clusters), so I just picked up a (somewhat similar) technology that I know and used (a bit). I think readers will do the same, try to base their conclusions on known examples. Bug #84731 - "Group Replication: mysql client connections hang during group replication start". There is no reason to hang more than needed. We should just make sure reads and writes are NOT accepted until the node is a member of cluster and in sync. Bug #84773 - "Flow control slows down throughput while a node join the cluster". Let me quote: "This is done this way by design, that is, request group to slow down while the member is fetching and applying data." Bug #84774 - "Performance drop every 60 seconds". Now this sounds like a performance problem to work on, maybe by adding some tuning options. Bug #84784 - "Group Replication nodes do not rejoin cluster after network connectivity issues". It would be really nice for nodes to try to re-join the cluster in case of short term connectivity issues. Galera nodes do not give up that fast. The bug is still not verified. Bug #84785 - "Prevent Large Transactions in Group Replication". Galera somehow allows to limit transaction size. Not that there were no related bugs, but still options exist. Bug #84792 - "Idle GR Cluster: Member CPU hog". Not yet verified, but it seems in some cases node can use a notable share of CPU time for no clear/good reason. Bug #84900 - "Getting inconsistent result on different nodes". Now, this is really unfortunate (for a "cluster") and somewhat similar problem was reported by Vadim before, see Bug #82481 and was supposed to be fixed. Anyway, the inconsistency is repatable and looks somewhat scary. Now, make your own conclusions about the maturity of Group Replication in MySQL 5.7.17. I manage to avoid it so far, as I try to keep myself as far from any kinds of "clusters" as possible... Had not worked well with Galera, unfortunately - I have to read its verbose logs on a daily basis. My previous post on MyRocks was intended to provide some background details for a couple of slides for my FOSDEM talk on profiling MySQL. The results and performance demonstrated by MyRocks vs InnoDB from MySQL 5.7.17 were not really important to show how perf helps to understand where the time was spent while executing of one specific query vs the other (with the same results, but different plan), but they still caused a lot of comments from people who care, so I decided to double check and clarify few more details. 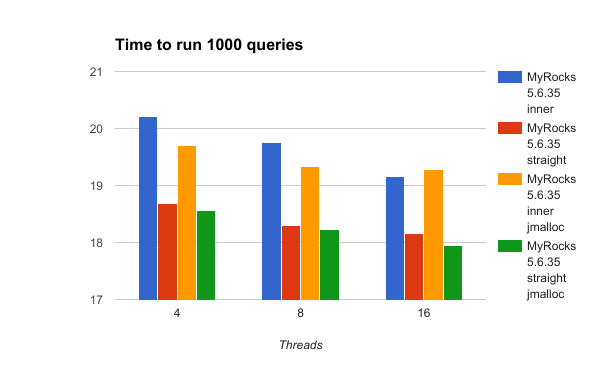 I was interested more in comparing scalability and performance of these different ways to execute the same query, just because usually it's considered good to have covering secondary index used instead of creating temporary table and filesort for this kind of queries... The reality shows this is not always the case. [openxs@fc23 fb56]$ bin/mysql -uroot -e"show variables like 'rocks%'"
and hardware details of my QuadCore box with HDD were shared previously. I tend to think no tuning is needed for such a small tables and corner read-only use case (if maybe READ COMMITTED isolation level, that I plan to study separately, as initial attempts had not shown much difference). You can guess that I tried to add some more options along the lines of the fine manual, but they had not changes things much to better, so I've commented them out. Using jemalloc helps to get a bit better throughput for both queries (I tend to consider the INNER case with 16 threads a fluctuation for now), but not much. New build based on fb-mysql-5.6.35 branch as of yesterday's morning demonstrates worse performance for STRAIGHT_JOIN case (access via PRIMARY keys + filesort) comparing to the previous build from January 30, 2017 based on webscalesql-5.6.27.75 branch. I am yet to find out why is it so, as INNER JOIN case performs a bit better. I am open to any MyRocks runing suggestions for my old QuadCore box, as for now MySQL 5.7.17 performs notably better on this same hardware and data in the tables, with --no-defaults. No wonder, a lot of efforts were spent by Oracle on Bug #68079, while all I've got so far for MyRocks is public "Can't repeat" of a kind, plus simple tuning advices with limited impact for my case.